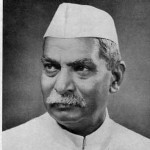 Rajendra Prasad was the first President of the Republic of India. An Indian political leader, lawyer by training, Prasad joined the Indian National Congress during the Indian independence movement and became a major leader from the region of Bihar. A supporter of Mahatma Gandhi, Prasad was imprisoned by British authorities during the Salt Satyagraha of 1931 and the Quit India movement of 1942. Prasad served one term as President of the Indian National Congress from 1934 to 1935.